(HealthDay News) -- Women can dramatically lower their likelihood of heart disease prior to old age by following healthy living guidelines, according to a large, long-term study. The study found that women who followed six healthy living recommendations -- such as eating a healthy diet and getting regular exercise -- dropped their odds of heart disease about 90 percent over 20 years, compared to women living the unhealthiest lifestyles. The researchers also estimated that unhealthy lifestyles were responsible for almost 75 percent of heart disease cases in younger and middle-aged women. "Adopting or maintaining a healthy lifestyle can substantially reduce the incidence of diabetes, hypertension and high cholesterol, as well as reduce the incidence of coronary artery disease in young women," said the study's lead author, Andrea Chomistek, an assistant professor of epidemiology and biostatistics at Indiana University Bloomington. Although cardiac deaths in women between 35 and 44 are uncommon, the rate of these deaths has stayed much the same over the past four decades. Yet at the same time, fewer people have been dying of heart disease overall in the United States, Chomistek said. "This disparity may be explained by unhealthy lifestyle choices," she said. "A healthy lifestyle was also associated with a significantly reduced risk of developing heart disease among women who had already developed a cardiovascular risk factor like diabetes, hypertension or high cholesterol," she said. The findings are in the new issue of the Journal of the American College of Cardiology. The study followed almost 90,000 nurses from 1991 to 2011. The women were between 27 and 44 years old when the study started. The researchers focused on six behaviors described as healthy: not smoking, exercising at least 2.5 hours a week, having a normal weight, watching seven or fewer hours of television a week, eating a healthy diet, and drinking some alcohol but no more than about one drink per day. Around 5 percent of the women fit into this category at any one time, according to Chomistek. The study also looked at risk factors for cardiac disease like diabetes, high cholesterol and high blood pressure. "Even though heart disease is pretty rare for a young women, developing a risk factor for heart disease is not," she said. 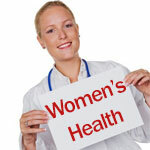 About 45 percent of the women developed one of these risk factors, during the 20-year study period, Chomistek said. A healthy lifestyle helps these women, too, the study found. "Women who had diabetes, hypertension or high cholesterol and adhered to a healthy lifestyle had a much lower risk of subsequently developing heart disease -- i.e. having a heart attack -- compared to women who did not adhere to a healthy lifestyle," she said. "Many of these women were on treatment for their risk factors, but lifestyle was still very important for preventing subsequent heart disease," Chomistek noted. Would these findings be similar in men? Death rates from heart disease in younger men have stubbornly resisted declining like those of women, "and this merits further study," Chomistek said. In both genders, "there is unequivocal evidence that a healthy eating pattern, being physically active, maintaining an ideal body weight and not smoking are strongly related to reduced risk of heart disease," said Donna Arnett, chair of epidemiology at University of Alabama at Birmingham School of Public Health and past president of the American Heart Association. She wrote a commentary accompanying the study. Many women "lack knowledge that heart disease can affect them at any age, and they might not recognize the symptoms of heart disease," Arnett said. "While many women have classic symptoms of heart attack -- like crushing pain in the center of the chest that radiates to the neck/arm, shortness of breath and profuse sweating -- others have back pain or indigestion." This study confirms the importance of healthy behaviors, such as not smoking and exercising more, Arnett said. And these findings also play a role in moving the public discussion toward "creating a world where doing those things is the default option."